Two sister regional dailies published exclusive splashes about a convicted killer finally admitting the murder of a pensioner – after 12 years of protesting his innocence. 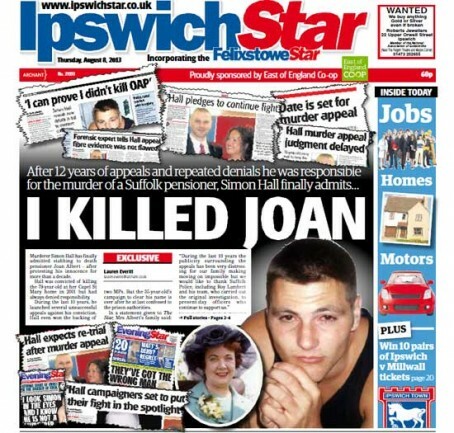 The East Anglian Daily Times and the Ipswich Star were the first to report that Simon Hall had finally confessed to murdering frail pensioner Joan Albert in 2001, after a series of expensive appeals against his conviction. The Archant Suffolk newsroom got the story first after being contacted by the victim’s family and different splashes by journalist Lauren Everitt were published by the regional dailies, which were followed up by national newspapers, radio and television news. 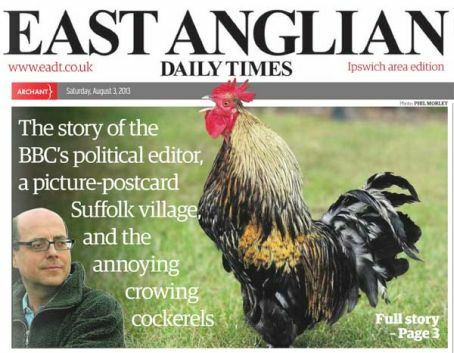 And the exclusive on the confession came just days after the EADT published an exclusive light-hearted story about BBC political editor Nick Robinson’s run-in at dawn with a cockerel outside his home in Orford on the Suffolk coast. Terry Hunt, Archant Suffolk’s editor-in-chief, said: “These were obviously two very different stories – one very light-hearted, the other what we hope will be the conclusion of a long-running and tragic saga. The story about the cockerel came about after Nick took to Twitter to express his fury at being woken at 5am by the creature’s crowing and confessed to having thoughts of silencing it. Reporter Paul Geater spotted the tweet and headed out to Orford, managing to track down the culprit cockerel and interview its owner. Later Nick spoke to Paul via Twitter and apologised for his earlier anger. The story made page one and three of the EADT and was covered extensively in most of the nationals over the following days.